ROAM Robotics’ SKI Exoskeleton joins the Ski~Mojo and Againer to become the third wearable system for skiing. What makes the ski slopes so alluring for exoskeleton developers and how do the three commercial knee assisting systems compare? 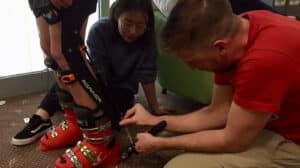 There are so few commercial exoskeletons for the general public compared to those for medical, military, and work/industrial use, so why is the skiing application so popular? The main reasons are existing peripherals, mindset, cost, and need. Let’s dive deeper into each point and explain what is meant by that. First, the ski boot is an excellent attachment point for an exoskeleton device. Skiing already comes with a mandatory wearable, the ski boot. The ski boots attach to the user’s skis or snowboard and while they come in different shapes and sizes, they are relatively rigid and tall. The ski boots represent an easy connection point for exoskeletons and wearable robots. The ski boot can have a strap, bolt, or another similar device to connect it to the exo. The ski boot stabilizes the exoskeleton in place and it can offload its weight into the skis and the ground. 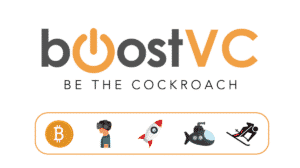 This is no small feat, just ask Mark Roser from Open Innovators who has been working on an attachment to common shoes and hiking boots that can connect the user’s foot to an exoskeleton. Second, recreational skiers have the mindset to purchase and use an exoskeleton. Skiing already requires so many peripherals. There are the already mentioned ski boots, the skis themselves, the ski poles, ski goggles to reduce the brightness on slopes, and layered clothing. Skiers willingly carry all of this gear and know that they will have to set aside time to don and doff (put it on and take it off). There is already the mindset that setting up to ski will take time, and conceptually, an exoskeleton can become just one more piece of gear. This places skiing in stark contrast to other recreational activities such as jogging, tennis, soccer, etc… where the gear is kept to a minimum. Third, skiing is expensive! For most people, driving to the local ski resort takes hours. In the case of the ROAM SKI Exoskeleton which was tested in Lake Tahoe, driving to Heavenly Village from San Francisco (their HQ) is a three and a half hour drive. In addition, a basic hotel room near the gondola usually starts at $180 per night and $42 to go up the lift once (without a season pass). Factoring in all of the costs, skiing is an expensive recreational activity and those who can afford it will find the price tag of a ski exoskeleton more palpable. Fourth and final, ski exoskeletons are laser focused on a need. Skiing puts a good deal of strain and stress on the knees. A ski exoskeleton can act as a shock absorber for the body, reducing the bumps and amplitude of load on the knees (and according to some claims, the lower back as well). Furthermore, ski exoskeletons can potentially reduce fatigue, allowing skiers to stay on the slopes for longer. 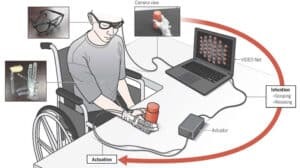 In other words, not only can these wearables be used for injury prevention, but they could also potentially allow older people to enjoy skiing and remain active for many more years. Compare ski exoskeletons, which have a clearly defined use to let’s say, shoulder support exoskeletons. One wearable is focused on a very specific application, while the other has been left a bit open-ended and ubiquitous. Are you a skier and do you imagine yourself ever wearing a ski exoskeleton? Share your thoughts in the comments section below. Be warned, if you are new to the discussion, your comments will not appear right away as each one is checked by our spam filter and read by our team first.